> Research Library > Stream Data Centers > Data Center Planning — Who’s on First — Real Estate or Technology? According to The Data Center Journal, data center investments in the U.S. reached record levels in 2017 — more than $20 billion. 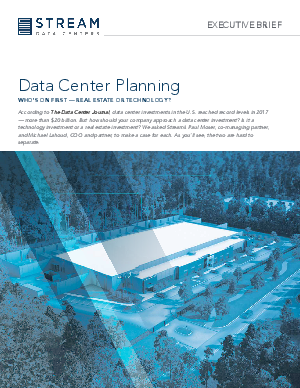 But how should your company approach data center planning and a data center investment? Is it a technology investment or a real estate investment? Stream’s Paul Moser, co-managing partner, and Michael Lahoud, COO and partner, make a case for each. As you’ll see upon reading the new executive briefs, the two are hard to separate. Ultimately, two out of two experts agree that combining the interests of real estate and technology leads to the ideal data center strategy for your company. Whatever you call the investment, make sure that your provider delivers the best possible solution that meets your needs today while offering flexibility for the future. Lahoud chimes in later in the report on what he calls "the bottom line." That being, "all involved parties should be at the table at the beginning of data center discussions."